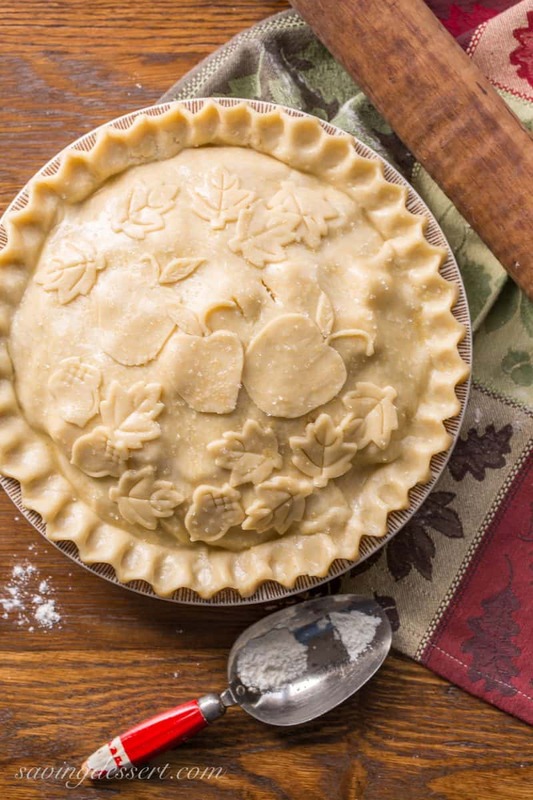 We love our recipe for flaky double pie crust – watch this video and learn how to make Perfect Pie Crust in 3-easy steps! Click HERE to view the post and print the recipe. 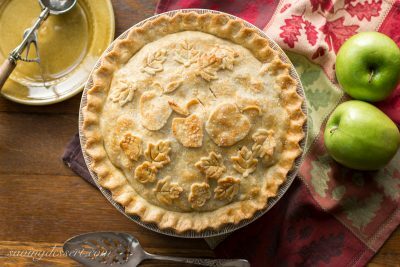 Our Classic Double Crust Apple Pie Recipe – made with tart, juicy apples piled high and wrapped in a buttery, flaky, double crust pastry. To me, nothing says ‘home’ like Apple Pie! Apple pie is, by far, my favorite to make because each and every pie turns out unique, with character all its own. If you’ve never tried making an apple pie recipe, then allow me a moment to argue on its behalf. This is the year you can surprise your family with this amazingly wonderful, simple dessert. It’s not a one bowl deal, but it’s so much easier than you might think. You don’t have to make homemade pastry if you’re ‘crust-a-phobic’ … just buy a package of refrigerated pre-made pastry and give it a go! Julia Child said we should be “fearless in the kitchen.” She was right! 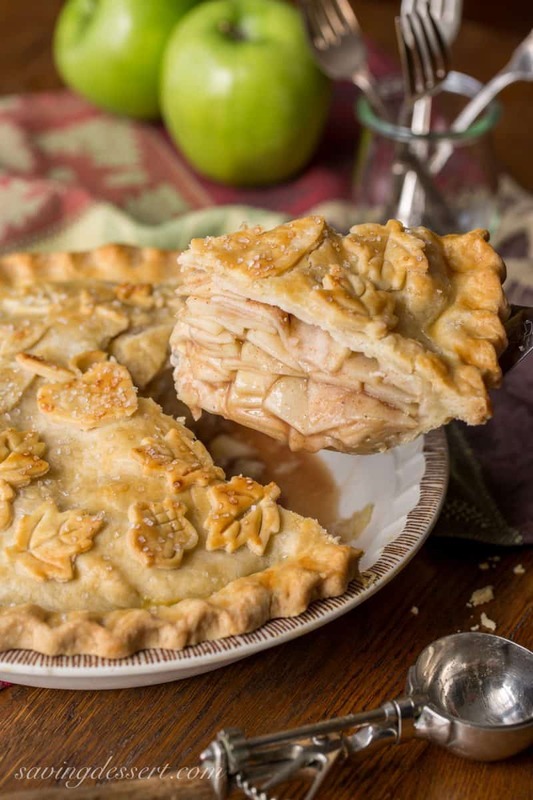 If you can peel and slice an apple (or eight), you can make this wonderful apple pie recipe. I bake a lot, and know that sometimes it takes a few tries to get everything just perfect. But this apple pie is not difficult to make and it’s worth the effort. This particular pie ended up super thick (a/k/a fat and chunky) but you can make it thinner if you want (make it fat! You won’t be sorry.) It’s a little harder to cut and serve, but if the apples fall out, serve it in a bowl, with ice cream, of course. If you allow the pie to cool to room temperature, it will hold together much better. 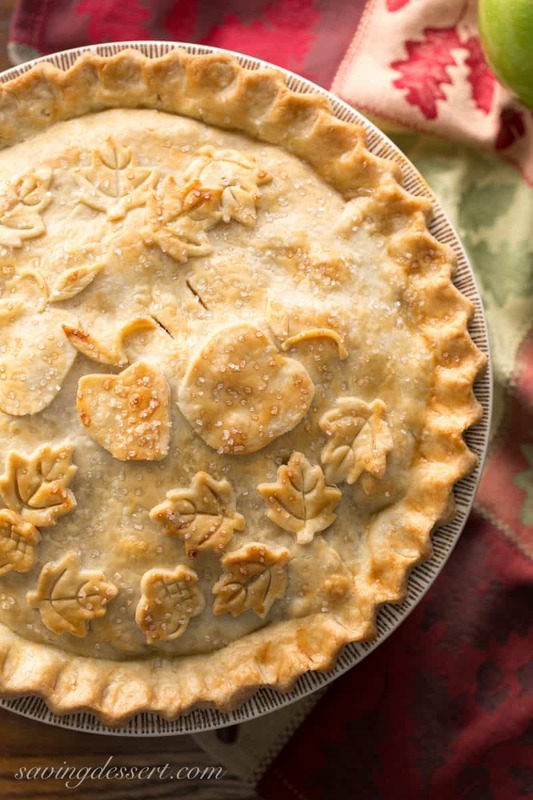 Even though Thanksgiving has come and gone, there’s no reason you can’t have apple pie at your next holiday celebration! Serve it with a slice of cheddar cheese (really – it’s delicious) or a big scoop of ice cream. Dulce de Leche or vanilla are my favorite ice cream flavors to serve with apple pie. Pie is the answer to all those “what should I make for dessert” questions! It’s perfect all year long. Trust me on this one! 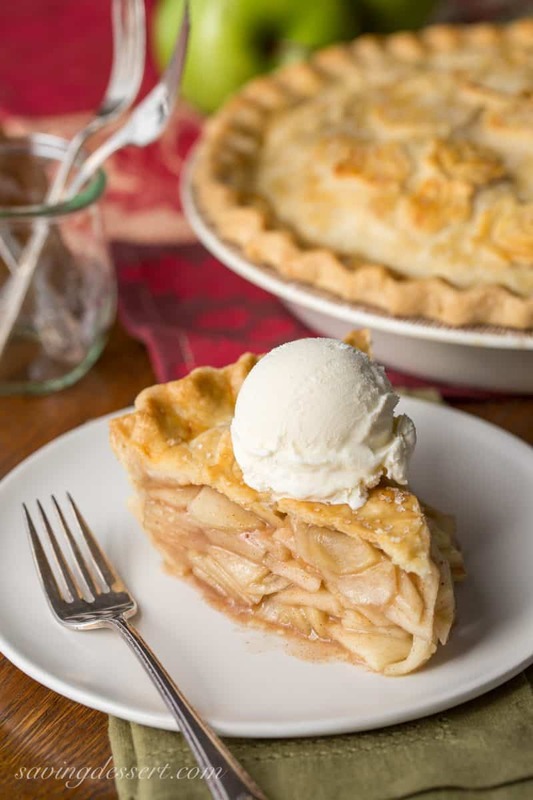 Finally, do you prefer your apple pie with or without ice cream? I say “with” please! 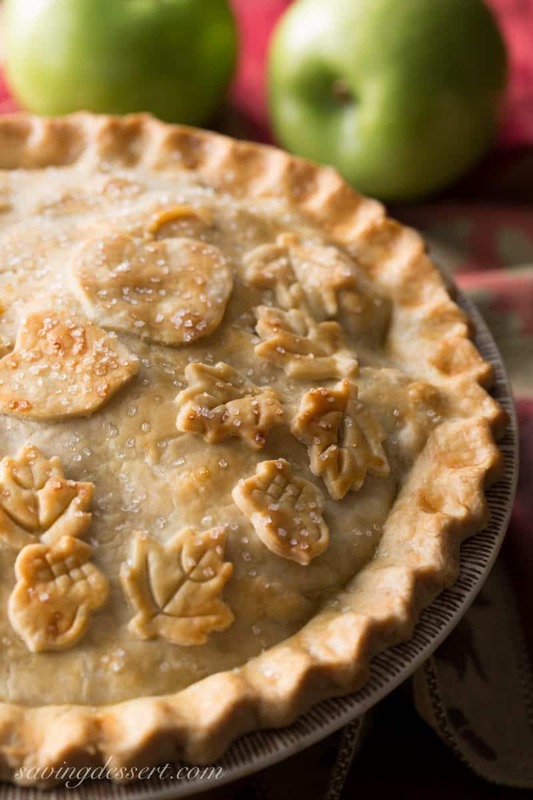 Made with tart, juicy apples piled high and wrapped in a buttery, flaky, double crust pastry. Line the bottom rack of your oven with a large piece of foil in case juice bubbles out of the pie while baking. Bake at 375 degrees for at least 1-hour, and up to 1-hour and 15-minutes depending on the height and thickness of the pie. The filling should be bubbly and the crust a golden brown. When checking the pie, you should be able to hear it bubbling inside the crust. If the crust is over-browning during baking, tent with foil. Remove to a rack to cool. Serve with a slice of cheddar cheese or ice cream if desired. Pie should keep lightly covered at room temperature for up to 3 days. Refrigerate leftovers if desired for longer storage. 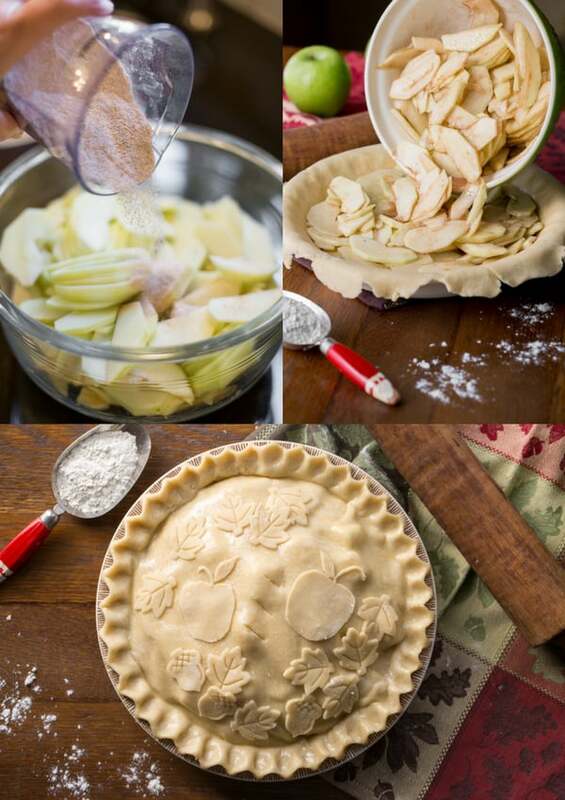 Be sure to check out our Perfect Pie Crust Recipe in 3 easy steps including a how-to video. Click HERE to get the recipe. Are all your presents wrapped and under the tree? I’m not very good at getting that far ahead. Are all your Christmas cards addressed and mailed out already? Yeah – I have lots of work to do! What a GORGEOUS pie, I could sure go for a slice it’s so nice and thick! A beautifully made apple pie, look out Martha…you’ve got some hard competition here. Apple is my favorite pie and this one is almost too pretty to eat. Hi Tricia, gorgeous apple pie, love how you decorated the crust. My favorite pies are cherry and apple, great idea to try Dulce de Leche with the apple and no I am nowhere done with my Christmas shopping, way behind this year. I love that gorgeous crust! Your family is just so lucky. Apple pie and apple galette are the same so I know you can make this! Have a wonderful week Monica! My husband would love it if I served him this delicious looking apple pie. It looks fantastic Tricia, you outdid yourself. Thanks Gerlinde 🙂 Hope you’ll give it a try! Your pie skills continue to amaze me! Absolutely beautiful 🙂 And I would have a hard time picking my favourite pie. I love them all. Aww thanks Jennifer! I do enjoy playing with dough! Apple pie is by far my family’s favorite and always present on our Thanksgiving table. Yours is stunning, Tricia! Thanks Susan – I think my family would eat it any day of the year. So much fun to make too! Absolutely gorgeous!! I can just imagine the taste of the filling and the crust must be sheer heaven. I’ve pinned the recipe to make at a later date! Hi Marisa! Thanks so much for stopping by and commenting. I love being able to PIN recipes to make later 🙂 So much inspiration on Pinterest. Thanks! Have a wonderful holiday season. Have you ever made apple pie without cinnamon or nutmeg. You really should because the apple taste really shines through. I am originally from England and never had cinnamon in my apple pie. When I first tasted apple pie with cinnamon all I could taste was the cinnamon, henceno cinnamn in my pies. No I haven’t tried that Margaret – but I will! There are so many apples in this pie – you can really taste the apples but I understand what you’re saying. I love it when you can actually taste the fruit in a pie or dessert. Thanks for reading and commenting! Loads of apples in this one Monique 🙂 Thank you! this looks spectacular… look at those glorious layers of apple. I’m a bit mad because I like my pie cold, with cream! Divine! Tricia, you make the most gorgeous pies, prettier than any pastry shop I’ve ever been to. I can’t believe how high and loaded with juicy apples this is. I’ll take mine warm with a scoop of vanilla ice cream please! Thank you Chris! You are so sweet – and vanilla ice cream works for me too! o Tricia, this looks beyond delicious and it’s so beautiful too! What an absolutely perfect beautiful pie. I bought some of those cut-outs at Sur la Table awhile back. You’ve inspired me to get my rear in gear and use them. Hi Lea Ann! Thanks so much for stopping by and happy baking! I’m a Granny Smith kind of gal too! Those are the only apples I have ever used and they are delish for making apple pie! Your pie is beautiful and I also the cutouts to decorate. Happy baking.